On February 13, a ritual event to create Buddhist deity ‘White Tara for One Day’ took place at the Bogd Khaan Palace Museum. Concurrently, a themed exhibition ‘White Tara’ opened at the exhibition hall of the museum. During the reign of the eighth Bogd Jebtsundamba Khutaktu, there was a tradition to create White Tara in compliance with Divine proportion of High Saint Zanabazar in the eighth days of every month. The ritual has been halted since it was done in 1924 last time. 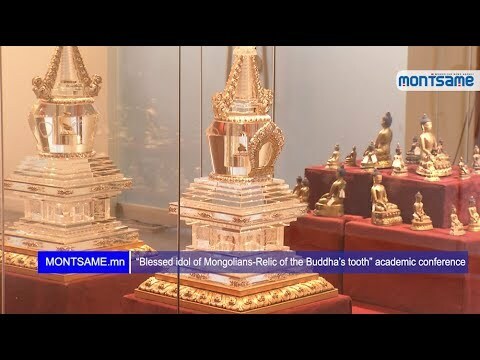 However, the Bogd Khaan Palace Museum revived the ritual in 2013, since then the event White Tara for One Day’ and ‘White Tara’ exhibition have been organized in collaboration with ‘Soyoloor Giiguulekhei’ NGO. Director of Bogd Khaan Palace Museum Ts.Erdenebaatar: “It is said that the ritual of creating a White Tara for one day has been existed from the old times. According to some materials and sutras, the creation of White Tara started in the mid-1600s during High Saint Zanabazar’s time. Previously, well-known painters had participated in the event, however this time disciples of Buddhist Schools and students of the Art schools took part. According to the ancient tradition, an artist was granted the right to craft another deity after creating one because it showed artists’ skills and their divinity of mind. In connection, one can understand that these students are going to defend their bachelor thesis in creation of god”. The ritual of creation of White Tara was done by over 10 artists. In the exhibition, White Tara that were made within the first eighth day of the first month of Lunar New Year over 100 years ago, White Tara created with the face of real person by Mongolian renowned painter known as Marzan Sharav are on display. Moreover, visitors sang the praise of White Tara and heard Sitatapatra or White Umbrella Mantra. The exhibition will run until February 18.